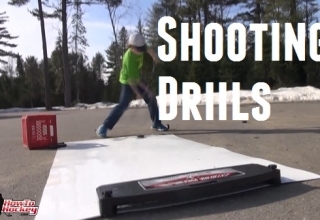 Hockey slideboards are a unique training tool that are meant to help players improve their skating at home. 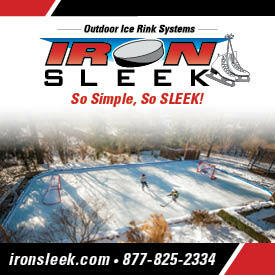 Unless you can afford to run a hockey arena in your back yard the entire year or install fake ice, a hockey slideboard is the only chance you have to simulate skating. When it comes to slideboards there are a number of options available. 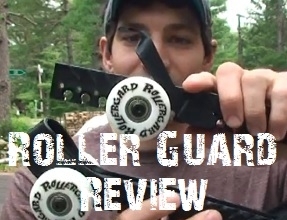 In this article we will be reviewing the Powerslide. For a detailed look at the powerslide, you can visit our Powerslide overview. We will also briefly cover a few topics here. The purpose of the slideboard is to provide hockey players with an area to practice skating. 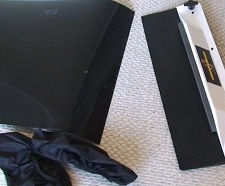 The slideboard is designed to be very smooth, and when used with the nylon booties people are able to slide smoothly from one side to the other. This sliding feeling replicates the feeling of sliding on ice with skates on. 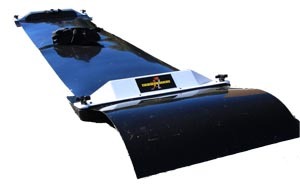 The Powerslide retails for $149.95 for the 8-foot size and $159.95 for the 10-foot size. 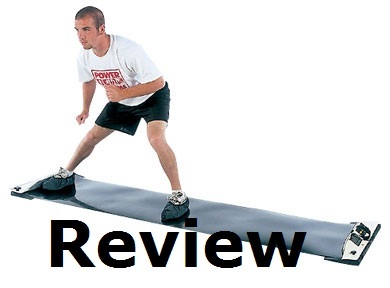 If you would like more information about the Powerslide, be sure to check back for our full Powerslide review. This was easy, all I needed to do was attach the two end pieces to the slideboard. One end piece is permanently attached with bolts, while the other can be moved in or out in order to allow more room to slide or less room to slide. 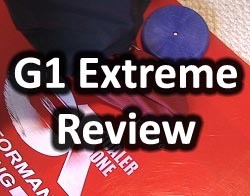 For this review I tested the slideboard to see how well I could slide, if it feels similar to skating, if I got a workout, and if I think it can help players improve their hockey skills. I was definitely impressed at how easy it is to slide on the slideboard. The nylon booties are great, and make sliding across very easy. I started by sliding back and forth, and just getting a feel for the board, then I increased the distance of the slide by moving the end piece. After a few minutes of going back and forth I could feel the burn. My inner thighs were starting to get a bit sore, and I could feel a bit of a burn in my upper legs. The feeling is similar to skating because you need to push off with one foot, and then glide with the other. The difference is that on the Powerslide you only go back and forth, not forwards. 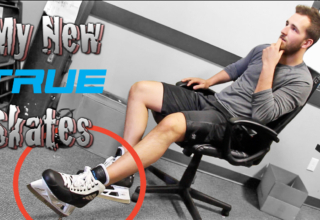 I think that the Powerslide would help hockey players who do not use their edges or those who “run” on the ice. I think younger hockey players will have more fun on the slideboard. As for me, after a while, sliding back and forth got a bit old. It kind of felt like public skating; I just can’t have fun without a hockey stick in my hand! That gave me a great idea though. 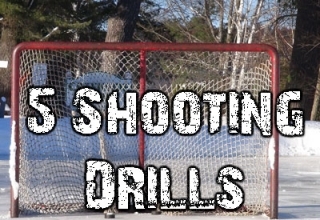 Why not take the slideboard outside and put it next to my hockey shooting board? The hockey slideboard was pretty fun to use indoors, but after I brought it outside and used it with my hockey shooting pad, my level of enjoyment increased significantly. I got a bit bored just sliding back and forth inside, but when I used the slideboard while shooting and stickhandling it was great. 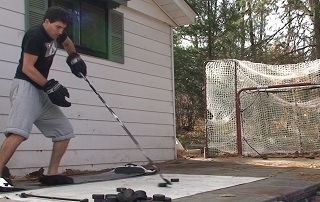 I actaully got a pretty good full-body workout after shooting and stickhandling for half of an hour. 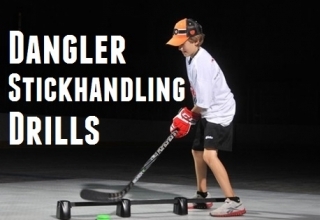 The slideboard also adds a whole new dimension to shooting and stickhandling practice. Instead of standing still I was now able to move laterally. This is great because it adds a new level of realness to the dekes and moves that I am practicing. I also like shooting while using the slideboard because I can incorporate weight transfer into my shot. I have been using the slideboard for a few weeks and I can honestly say that I have no beef with anything. It is meant to be a slippery surface to slide back and forth on, and that’s exactly what you can do. The only thing that got me was the price. It is $149 which is a bit expensive, but after looking at the price of other slideboard I realized that $149 is a pretty good deal. 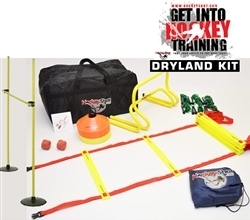 I recommend the slideboard to beginner hockey players, or good players who want to make shooting and stickhandling practice more fun and or challenging. 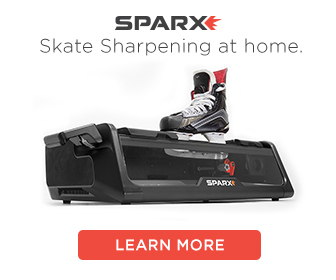 What is the best size for hockey? Is 6 feet enough or 8 feet is preferred? I would recommend 8 feet so you have lots of room to work with as you improve. The thing is garbage. Within 3 months of buying it, one of the plastic end pieces cracked, rendering the whole thing unusable.